Lying east of Madagascar, the volcanic sprung island network of Mauritius basks, remote, in the Indian Ocean. Though not the most obvious location of choice for writers of fiction (it might be my own ignorance but apart from this featured work and the one that inspired it, Mauritius set novels remain thin on the ground), its exotic, castaway spirit and colonial background offers much. Forever entrenched in history as the one-time home of the Dodo, and for its various visitors – first the Portuguese followed by the French in 1715, before the British took control during the Napoleonic era in 1810 – the former Commonwealth member, and now Republic, was predominantly harvested for its sugar. French writer Jacques-Henri Bernard de Saint-Pierre was so moved by the island that he set his heart-pranged philosophical tragedy ‘Paul et Virginie’ there. Alluding to the ideals of Jean-Jacques Rousseau, and arguing the case for the emancipation of slavery, tells the woeful tale of two good friends, self-sufficiently working and toiling what seems an idealized paradise, where everything is equal and shared. Fatefully their children, Paul and Virginie, fall in love, and through a set of events in which both characters prove their worth and condemn society’s ills, their feelings for one another prove costly. As it turned out, Saint-Pierre’s sentimental novel appeared on the eve of a real revolution, in 1787, as France was just about to explode with a, partly instigated, Bourgeoisie led people’s revolt. 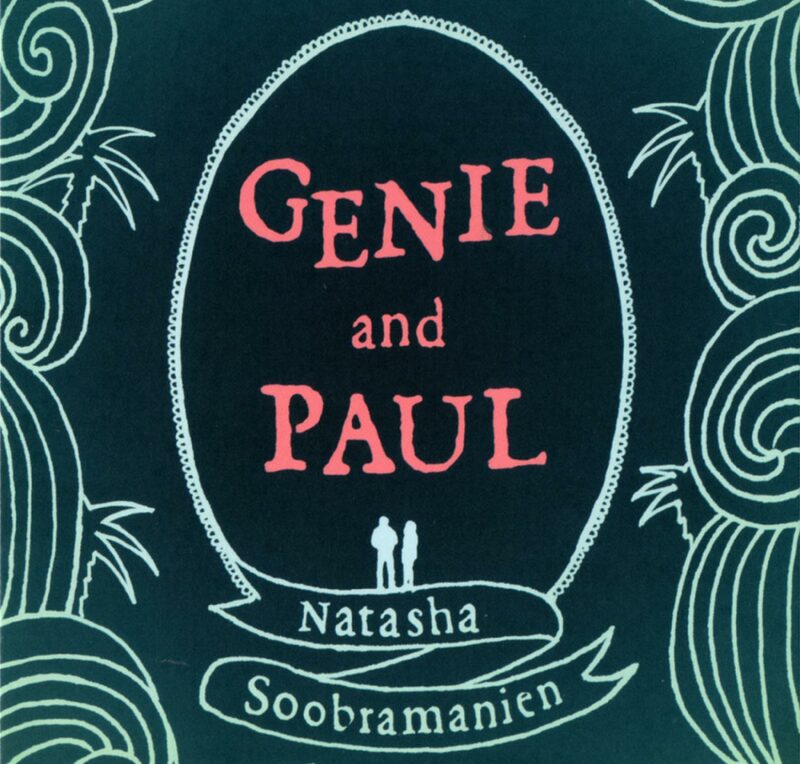 It’s this ‘enlightened’ text that inspires and acts as a literary tableau for debut novelist Nastasha Soobramanien’s Genie And Paul. Essentially a contemporary reworking, her own story is entwined and merged with this famous original, which is itself a bedrock of Mauritian folklore and culture. The central protagonists, Genie and Paul, are siblings; the object of their longing and affection for both each other and the romanticised home that never truly existed. Running back and forth through a thirty-year time span, and flipping between their roots in Mauritius and, their new home, East London, Soobramanien’s succinct narrative is viewed from not only the brother and sister’s separate perspectives but from a cast of minor, though important, supporting characters. Each account, insight and vantage point offers another piece in the story’s jigsaw. After a night out with her caring but miscreant brother, Genie awakes confused in a London hospital ward; an event that runs in tandem with tropical cyclone Kalunde’s destruction of Mauritius. In an almost seamless strand of flowing dialogue (devoid of all demarcated speech marks), longing passages and metaphorical anecdotes, the book’s central theme concentrates on Genie’s search for her adored brother Paul, who goes missing on the same night. Unbeknown to the reader at the time, a series of consequential actions and decisions made by the ensemble leads right back to Paul, who returns to the island of his imagination. Of course events don’t run smoothly, and the island he left behind many years ago has moved on without him – himself now a stranger. Genie’s recovery is swift but her search for Paul drags up many memories and old faces – some best left in the past, whilst others offer a second chance of reconciliation. A just, yet unblinkered view, of Mauritius and its even more remote poorer satellite Rodrigues, is contrasted with a colorful, musical rich, depiction of London, as Soobramanien’s controlled prose describing the hardships and travails of a family marooned. Poised and meticulously written, there’s hardly a word out of place let alone wasted sentence, each line justified in this lean but expansive novel. An apt pupil of the synonymous and famous East Anglia creative writing course (fellow worthy novelists on the course have included Ian McEwan, Kazuo Ishiguro, Deirdre Madden, to name just a few), Soobermanien has already contributed to an award-winning book – the London born author wrote two chapter’s of Luke William’s own 2011 ‘Saltire Society’s First Book Of The Year’ novel The Echo Chamber. With this inaugural mix of fable and realism, she carefully and tentatively plots out a plaintive, melodious tale of forgiving. What were your reasons behind the re working of the French Classic Paul et Virginie by Jacques-Henri Bernardin de Saint-Pierre? The reasons are various and complicated. I was drawn to reworking the text because of intellectual curiosity, nostalgia, anger, love, reverence…and so on. I’ve been aware of the book since I was a child. First as an object — my mother had an old copy and like Genie I was drawn to its illustrations—then for its totemic significance – it was the only book I knew of which was set in Mauritius, my parents’ island of origin. Then for its story, which my mother told me, in the manner of a fairy tale or myth. When finally I had enough French to read it for myself, my reaction was similar to the one described by Jean Rhys on her first reading of Jane Eyre – a sort of galvanising frustration, pride and anger. There was a wilful dishonesty about Paul et Virginie I wanted to redress and I guess this was my first writerly impulse—writing is a form of redress. At the same time, there was something magical about the book — quite at odds with this wilful dishonesty, I should say, since this magical aspect had a ring of truth to it — which I wanted to explore. I could not have paid this degree of attention to a book I disliked. The book deals with the relationship between a sister and brother and the love they share….so it moves away from the traditional idea of a love story, which I really like. Can you talk about this a bit more? In Paul et Virginie a boy and girl brought up as brother and sister fall in love. I wanted to play with this idea in my own book. I decided to make Paul and Genie real siblings (or half-siblings) to neutralize the straightforward romantic element of the original, but to retain its notion of intense love. Some sibling, or otherwise platonic, relationships can have an almost romantic quality, and I wanted to explore that. There is also the sense that Paul and Genie’s intense love for one another is almost a form of displacement: in the absence of a real sense of belonging, they find their homes in one another. Or at least Genie does in Paul. It’s almost Paul’s downfall that he can’t do the same with Genie. I love the very beautiful descriptions of Mauritius, but also of London during the early nineties in the novel [I recognised the club in Shoreditch as the old Whirly Gig venue] Do those descriptions resonate with you personally? I did go to Whirl-y-gig once! I felt pretty much the same way Genie did about it. Paul and Genie’s London is very much my London, yes. As a child I moved house an awful lot (my father was in the RAF), though we’d return to our family in North London between postings. So London took on a slightly unstable quality for me: it was never quite home but it was the closest thing I had to one. I still feel that now. The characters in the book are complex, flawed but ultimately very likeable because the reader can probably recognise a bit of themselves in one of the characters. Did you base them on anyone in particular, or were they just creatures of your imagination? A few people I know are convinced that Paul was based on them…But if he’s based on anyone, it’s me I’m sorry to say. No character ever springs fully formed from the writer’s imagination, they are always informed to some degree by what the writer has experienced, observed or read. A couple of the characters in Genie and Paul are based very closely on people I’ve known in real life. But in writing it’s not just characters who are drawn from life, but dynamics which might exist between characters too: Genie is not really like my own sister, but elements of our childhood relationship are certainly echoed in the relationship she has with Paul as a child. In my interpretation of the book [and do correct me if I am wrong!] In Paul’s case – it did address the issue of mental health and the isolation that a person can feel when they no longer live in the confines of a structured existence, it was painful to read, but written very beautifully, particularly the last page. Was this your intention when you set out to write the book, or did Paul’s life develop as it did as you were writing the novel? It took me ten years, on and off, to write this book. Or to get it right, I should say. That is, to get it to a point where I felt the book had realised my original ambitions for it and it was no longer possible to do any more with it. During that ten year period, the book changed many, many times. Whole subplots were written and discarded. I wrote it and rewrote it, changing the point of view, the tenses, the structure. But that last chapter was written in the year I began the book and did not change once during the whole ten years. So I guess Paul’s destiny was mapped out from the very beginning. What do you hope readers take away from the novel? It’s not something I feel comfortable about prescribing. Of course I hope that a reader feels some sense of having had an experience once they have finished the book. Beyond that, I couldn’t say.